Rt. Hon. Richard Seddon in 1905. 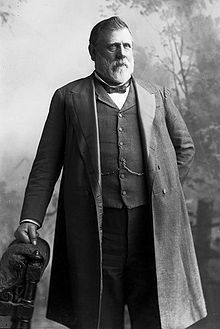 Richard Seddon (22 June 1845 – 10 June 1906) was Prime Minister of New Zealand from 1893 through 1906. He is the longest serving Prime Minister of New Zealand. He introduced women's rights for his country in 1893, 25 years before the United Kingdom did. ↑ The title "Prime Minister" was used by Richard Seddon after 1901, following New Zealand's self-exclusion from the Federation of Australia.See: "Prime Minister: The Title "Premier"". Te Ara – An Encyclopaedia of New Zealand, 1966. Retrieved 27 August 2007. This page was last changed on 12 June 2018, at 06:16.